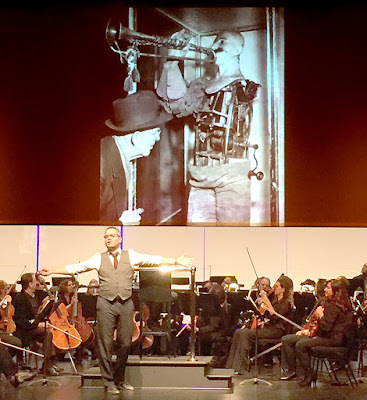 Since Andrew Grams took over as Music Director in 2013, the Elgin Symphony Orchestra has been systematically updating its programming by reaching outward from all areas of the organization, not the least of which being the stage of the Hemmens Cultural Center. Some people have always regarded a classical music concert as a test of etiquette governed by special rules known only to highly cultured individuals. Like wine appreciation, it was considered a game for snobs. But in recent years, just as the wine business has expanded through a populist outreach centered around consumer education, a similar approach is being skillfully and intentionally employed by the ESO. It started when Maestro Grams brought his unrestrained conducting style to the podium, and his personal accessibility to the Elgin social scene. Numerous appearances at local club meetings, in the media, at hospitals and libraries, and at casual mixers like the post-concert “Mingle with the Musicians” offered exposure for his outgoing personality and gift of gab. Inevitably this style found its way into the concert hall, where Grams developed a warm, witty rapport with audiences on a par with any professional emcee. Seen from the stage, the main auditorium at the Hemmens looks like a university lecture hall, and perhaps this contributed to his increasing tendency to indulge in colorful remarks on composers and their music. Having relaxed almost all stiffness out of the concert experience, the next logical step was to demystify the music itself. The ESO Listeners Club, pre-concert chats and program notes have always served that purpose, but they appeal to listeners who are already engaged, loyal patrons. With the help of visual aids, Music Director Andrew Grams explains the historical context of Beethoven’s Symphony No. 7. In order to reach a larger public, the ESO created the “Inside the Music” format to apply Grams’ knowledge and charisma to the task of audience education. 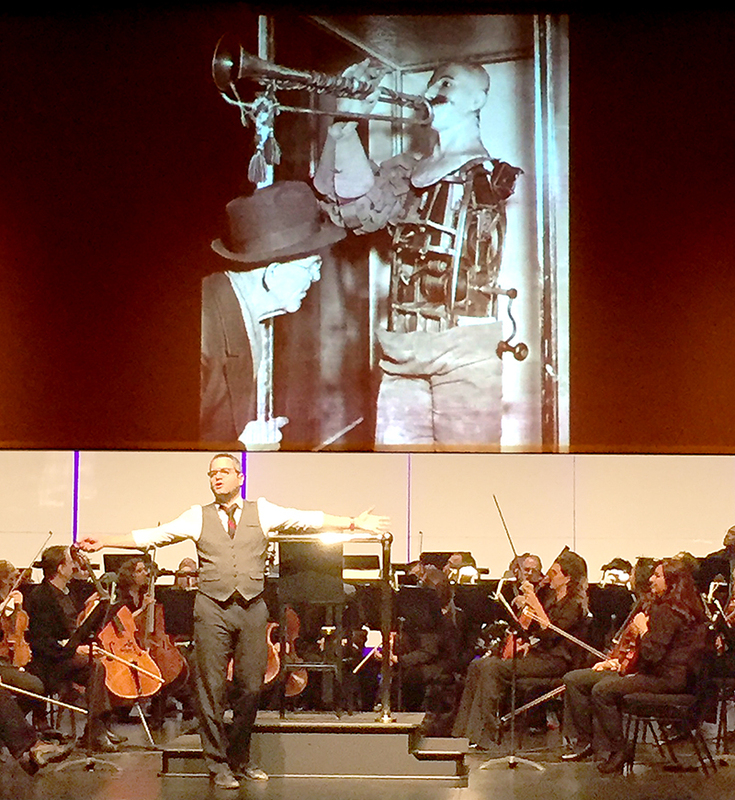 The result is a hybrid event consisting of a music appreciation class complete with multimedia and live orchestral excerpts, followed by a full performance of a major work from the classical repertoire. The latest in this series featured Beethoven’s Symphony No. 7. “He was not just some mysterious brooding genius,” Grams said of Beethoven the man. “He worked for a living; he fell madly in love; he was a human being.” The orchestra patiently demonstrated short passages, melodies, rhythms and even single notes to illustrate Grams’ analysis of the symphony’s building blocks. His message was that the music wasn’t so much superhuman in its origin, but simply a product of superb craftsmanship of a kind that anyone with a talent or skill can understand. 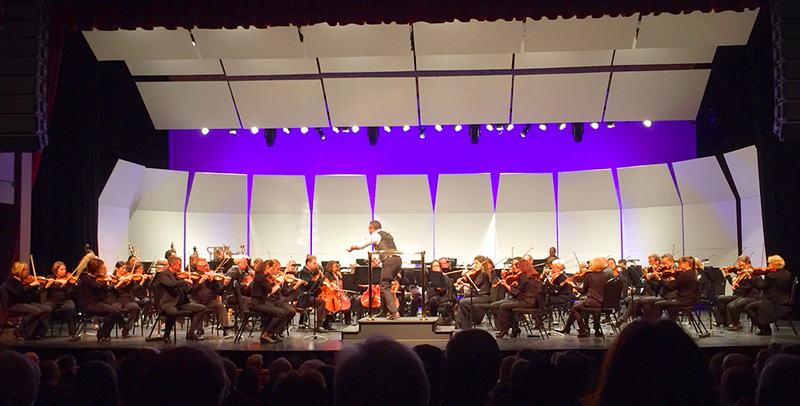 The Elgin Symphony Orchestra performs Beethoven’s Symphony No. 7. Beethoven seems to bring out the best in an orchestra, and Grams in his shirt sleeves was joyously animated in conducting the four-part masterpiece after intermission. The audience didn’t just clap after the allegro, they actually chortled at the Maestro’s jests. In some future or parallel universe, the symphony players themselves might expand their direct contact with the concert hall audience, but for now it’s the sparkle and glow of the conductor that influences how we feel about these performances. Grams seems to love working in this informal atmosphere, and honestly, when the music is this good, it doesn’t need any added ritual to enhance its quality or importance. The next “Inside the Music” event is set for Friday, March 23, 2018 at 8pm, featuring Edward Elgar’s Enigma Variations. For tickets and more information, go to www.elginsymphony.org. View the original post at https://theelginreview.blogspot.com/2017/11/playing-music-from-inside-out.html.